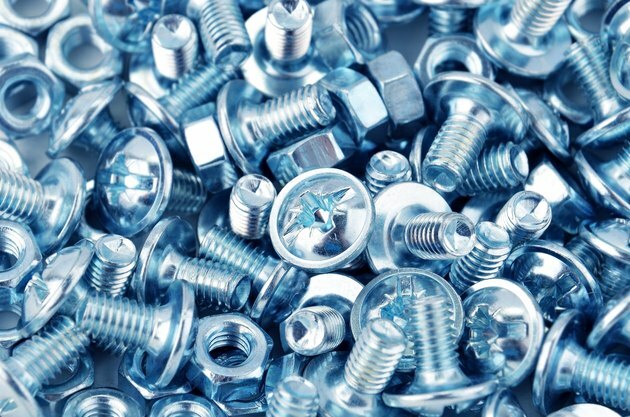 Nuts and bolts are designed to hold two or more objects together. They work by inserting a bolt through the two objects and then fastening a nut at the other end of the bolt. It's usually a very simple task, but unfortunately it can be made a little complicated thanks to different factors like what appliances need the nuts and bolts. Another thing to take into consideration is how the bolts are inserted into the objects and the kind of nut needed to hold it together. Before attempting to put the bolt through any hole, clear the hole of anything that may be in it and make sure that both the bolt and hole are clean. Also double check that you have the right size bolt for the hole. The hole may be threaded for a specific type of bolt so make sure that the threading on the bolt matches as well. Once everything is cleared, thread the bolt into the hole. If it gets stuck or doesn't continue going into the hole after a few twists, you may be using the wrong bolt. Don't try to keep threading or pushing it further because it will only damage the thread on both the hole and the bolt. If you are not using a threaded bolt, make sure that it fits snug but secure in the hole. It should be relatively easy to go through the hole, but there shouldn't be enough space for it to be wobbly. If the bolt doesn't get stuck when being twisted into the hole, and if it's long enough to stick out a little bit on the other side of the hole, then it should work. The extra part of the bolt on the other side will be for twisting the nut on to secure the bolt which will then hold the two objects together. Insert the bolt into the hole with the head facing outwards. For some threaded bolts or holes, it's best to use a wrench to twist it through. Take a nut that fits the bolt and place it at the opposite side of the bolt, away from the head. Then grab the head of the bolt so that it doesn't move around and hold it still while you spin the nut clockwise, gently pressing down on it. Keep spinning and adding pressure until the nut is against where the bolt comes out of the hole and holds the two objects together. If it's difficult to hold the bolt while spinning the nut on, consider holding the head of the bolt stationary with a wrench so that it doesn't move around.